Head Rests, Part III: Finally Sorted! Project “Getting-Head-Rests-Into Taiga-Lily” got finally completed this year. When we bought Taiga Lily in 2010, she came with her original vinyl-covered black front seats. The pattern is called basket weaves (“Korbflecht” in German), and the cross lines on the seat and the backrest mean they are from a “deluxe” or “L bus”. But they do not have headrests which I find a bit frightening. I started hunting on Ebay for seats with head rests, but black ones are rarely on offer. Last year I changed tactics and bought a brown passenger seat with a head rest which, together with an old brown driver’s seat from the Old Lady, formed a matching pair. 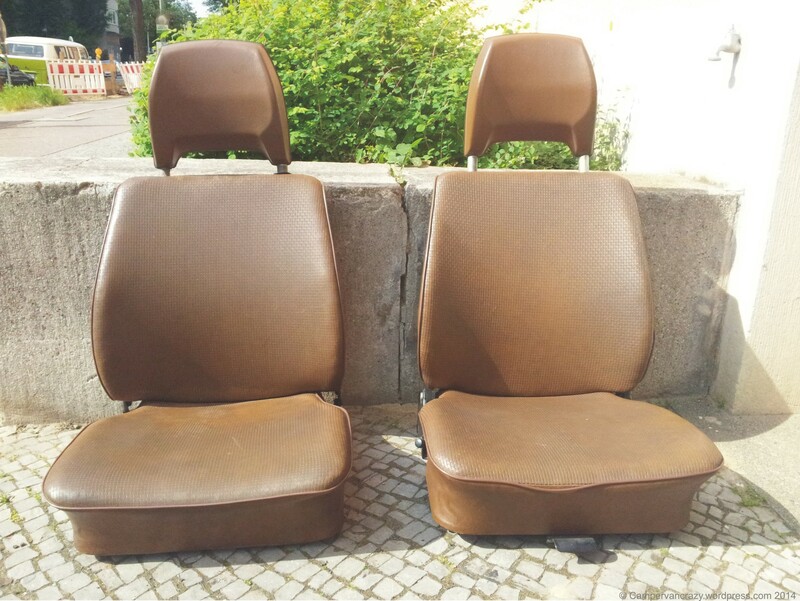 Brown instead of black, but at least original VW kombi seats and both with the basket weaves patterns. This all went to pot when I wanted to install them and learnt that the driver’s seat (from an 1978 late bay) did not fit into the seat rails in Taiga Lily (a 1976 late bay). Turned out some time in mid-1976 Volkswagen had changed the rails in the car and on the seats. 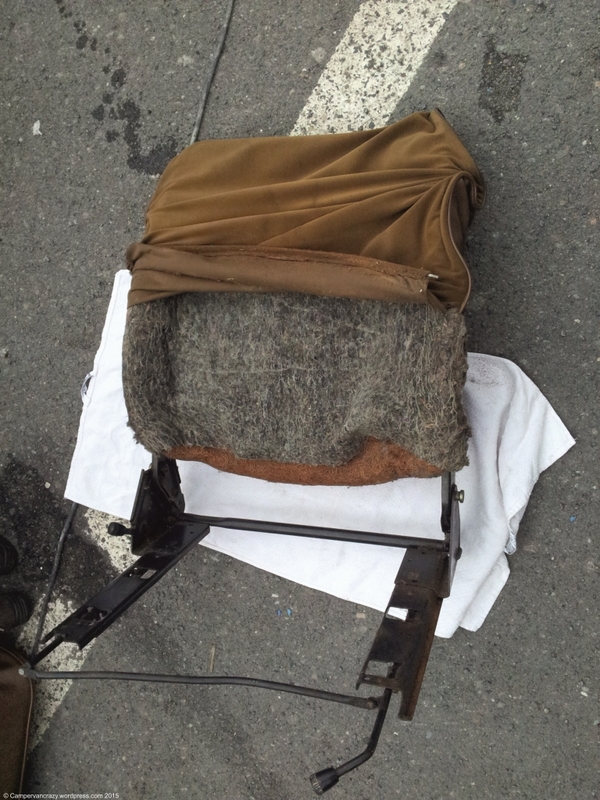 So the outcome was a brown passenger seat with a head rest and a black driver’s seat without. I later spent one afternoon trying to re-built the rails from the earlier driver’s seat to the later seat. But the ends of the rails are part of the the hinges that connect the seat to the backrest, and this connection is not identical between the two seat types. 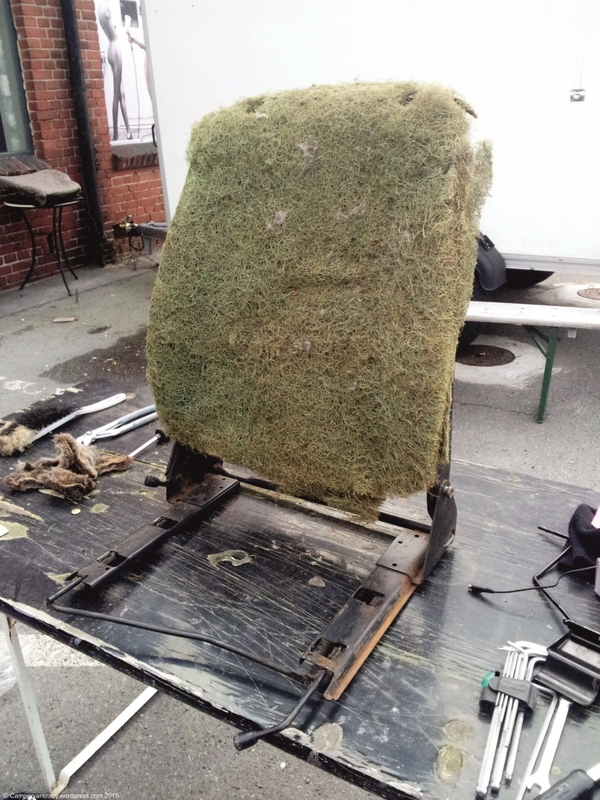 I was frightened I would end up with a “hybrid” seat that was not fully stable and may disintegrate in an accident. So I stopped, gave up with this line of attack and built it all back to the original condition. 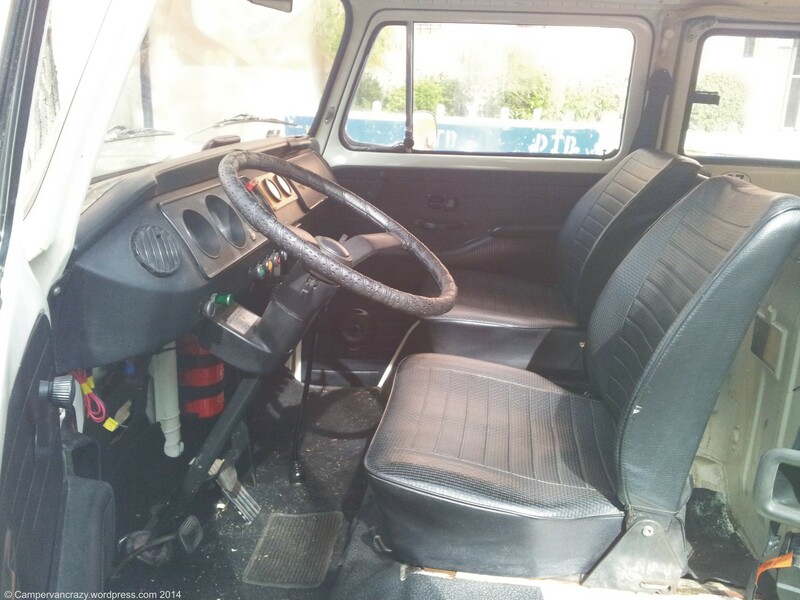 This year I found a brown driver’s seat on Ebay that was explicitly advertised as fitting only to early bay window buses and to the earlier versions of late bays. Yes! 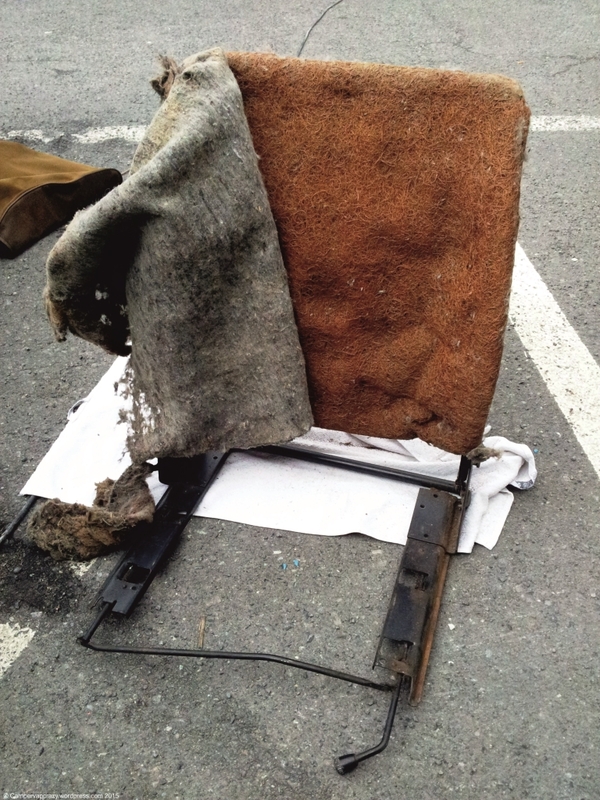 Draw back was that the pattern was not basket weaves but some strange brown textile material. But I bought it, took the cover off and built it up again with the basket weaves cover from the driver’s seat from the Old lady. 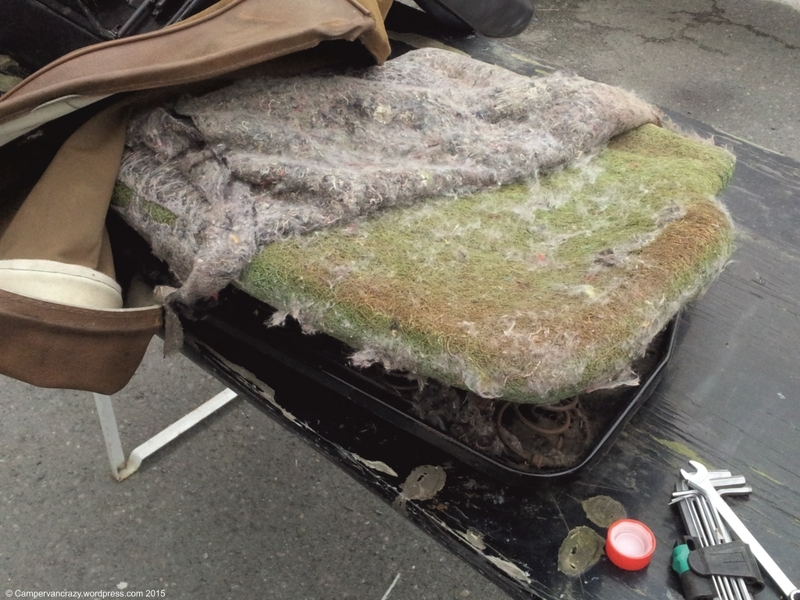 While at it, I also threw away the worn-out pads and replaced them with a new pad for the back rest (bought a while ago on Ebay, original VW part 211 881 775 G) and a new seat pad (repro purchased new from Bus-OK.de, OK60121). 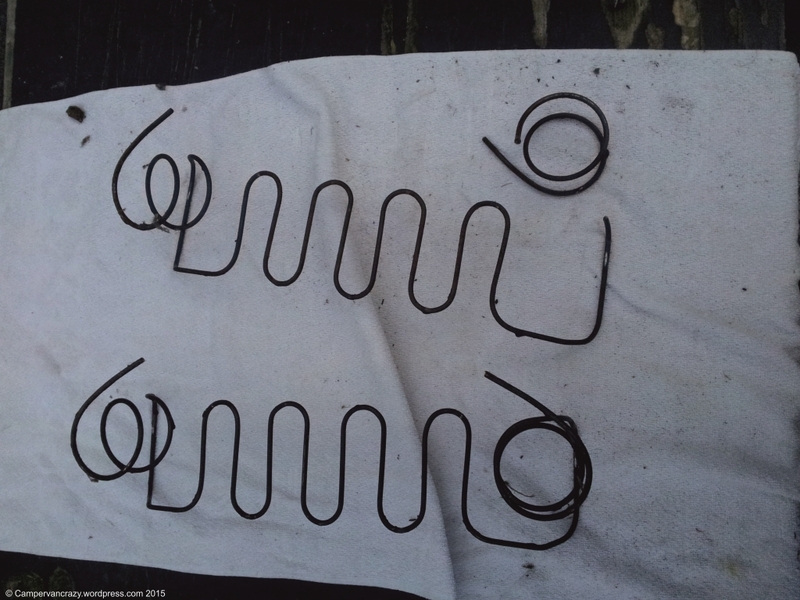 Turned out one of the wire springs of the seat was broken. I fixed it by stealing the corresponding spring from the seat of the Old Lady. So the original driver’s seat from the Old Lady is now in a bit of a sorrow state, stripped of its brown cover and lacking one wire of the springs in the seat area. 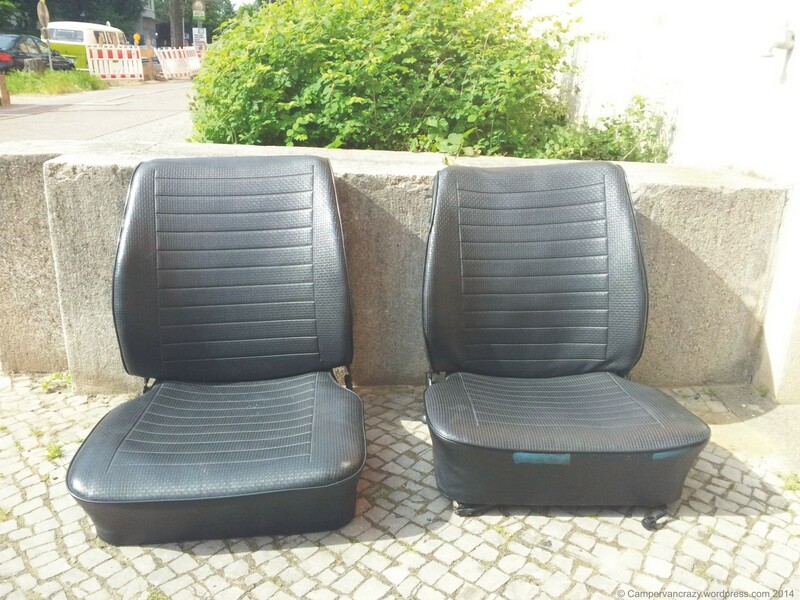 Original black seat (left), newly purchased seat with early bay base (middle), seat with late bay base (from 1978 late bay, right). 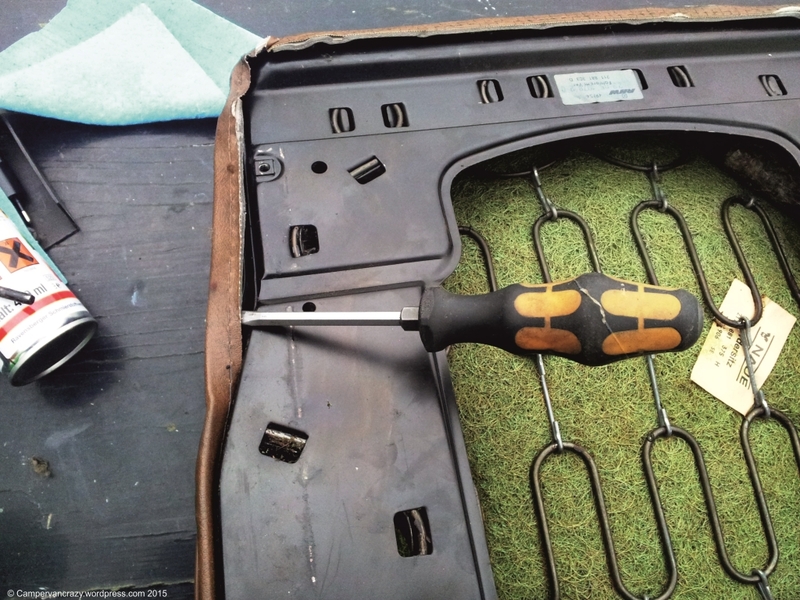 I noticed only at the end of re-assembly that this new seat is actually not from a T2a or T2b but probably from a T3 (explains the non-T2 brown textile cover and the plastic cover of one of the hinges), and the previous owner had swapped the rails and sliding mechanism to those from an early late bay window seat. When pulled, the sliding mechanism squeezes a bit into the base plate as the corresponding opening in the base plate is missing (red circle in photo below). But well, it is working for the time being. Base plate and slider mechanism of an earlier late bay kombi. “Hybrid” seat with late bay (or T3) base plate and early bay slider. Missing indentation indicated in red. Base plate and sliders of a later T2b (and T3) kombi. 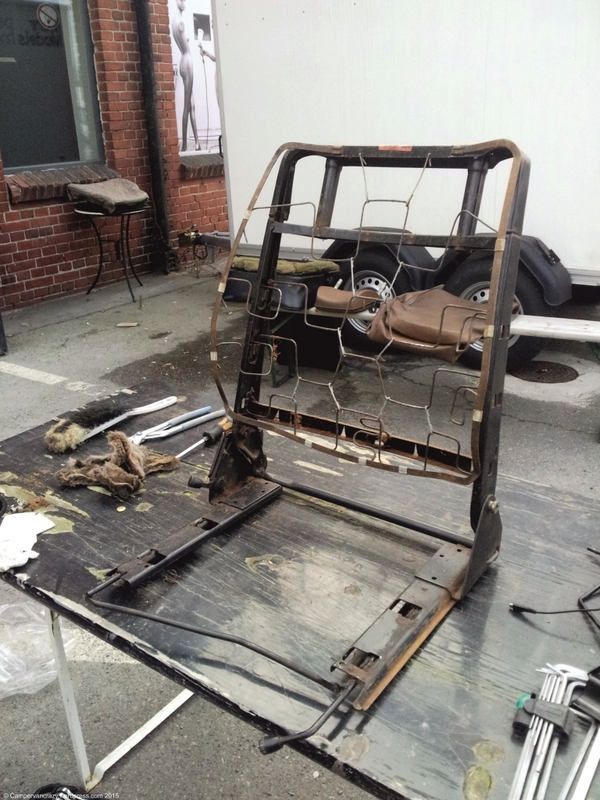 Will add some more photos below which show the different steps of the disassembly and reassembly of the seat. 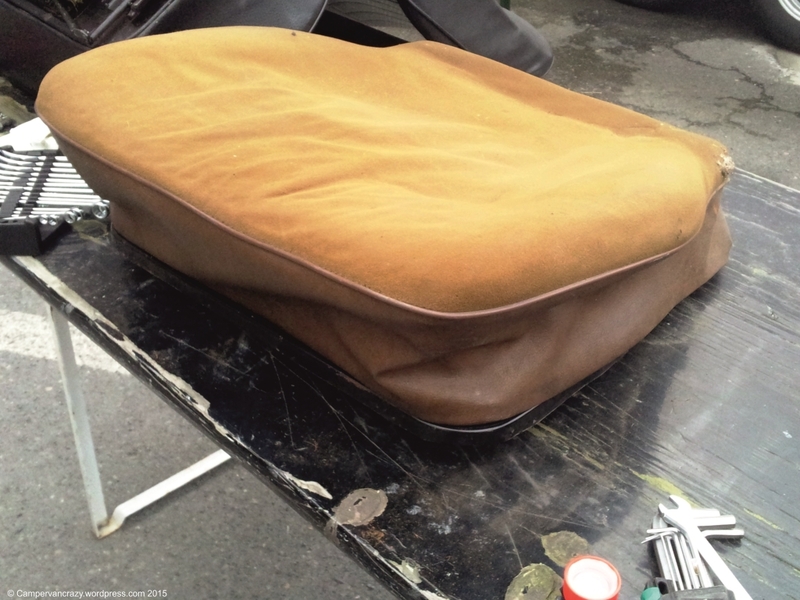 The covers for back rest and seat both have a 1-cm-wide cardboard rim sewn to the lower ends. This folds around a metal rim of the seat and back rest. Disassembly starts with carefully lifting this out with a flat screw driver. Project “Getting head rests into Taiga Lily” is causing some frustration. 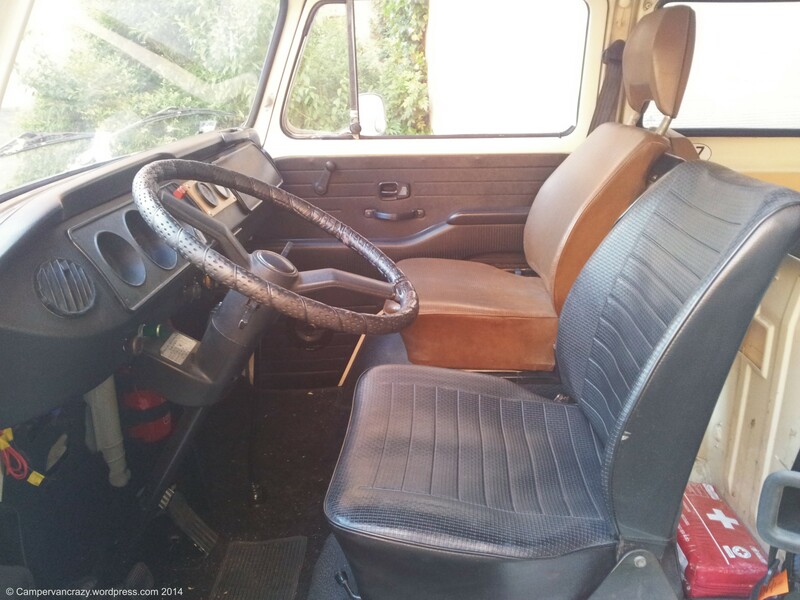 When we came home from Australia in mid-May, we went via Marburg and picked up the driver’s seat of our old bus from my parent’s attic. Together with the passenger seat I got last year on Ebay, I thought I had everything in place for a quick swap of both front seats, from head rest-less to head rest-full. Not the same color, but at least matching colors and original Volkswagen T2b seats, and a quick fix until I will find the correct black “L” seats with head rests. 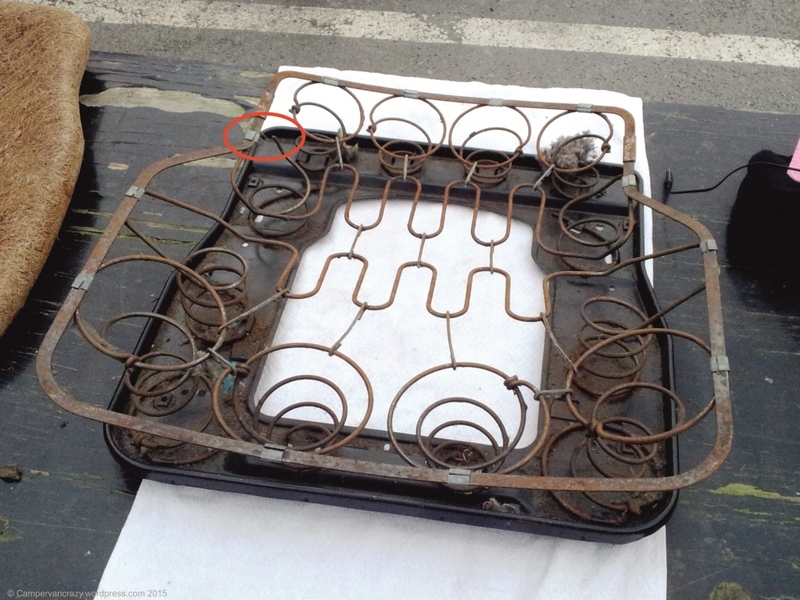 … and the new pair, from a 1978 VW panel van. The passenger seat clicked in no problem, but after 30 mins of wrestling with the driver’s seat I gave up. Turns out the driver’s seats from a 1978 bus and a 1976 bus have slightly different attachment rails (different shape and 3 mm further apart) and a different locking mechanism. Googling for the problem confirmed that there was a design change somewhere in 1976. The rails in the front cabin of later buses are compatible with seats from T3s and early T4s, but do not fit pre-1976 seats and vice versa. The metal base plate of both seats looks almost identical, just the rails on them, their attachment to the base plate and said locking mechanism differ. I gave up for the moment and will try to swap the rails between of the seats on one of the next weekends. Has anyone out there tried that already? Anything one should pay particular attention to? Plan B would be to swap the rails welded into the car (still have the 1978 rails somewhere). 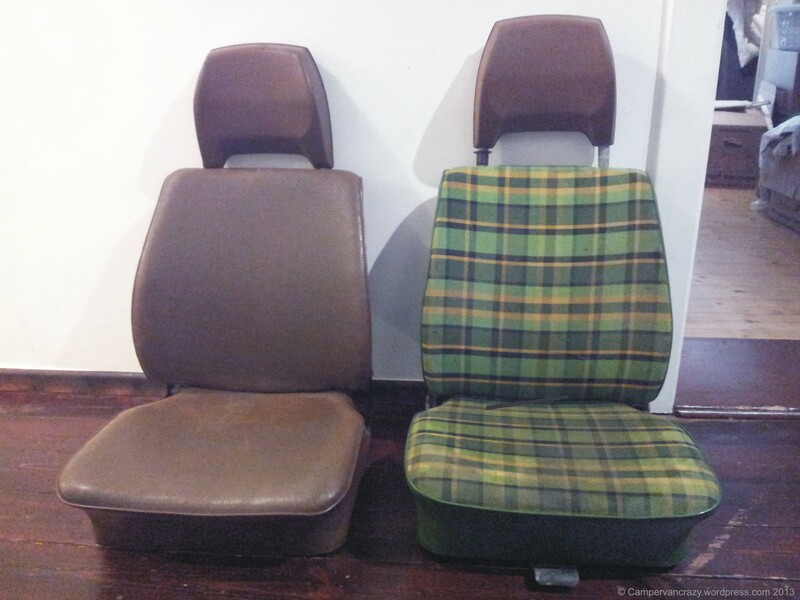 Or wait for a matching pre-1976 brown driver’s seat with a head rest on Ebay or somewhere else. I guess for the moment I live with a mixed brown and black pair of seats. Does not look great, but at least one seat is now a bit safer. … and after the partial operation. Well, not really new, second hand from Ebay. And not in brilliant condition either, but importantly with head rests, which Taiga Lily’s original seats do not have. Both seats are from late bay buses (1974-79). The brown one is for the passenger side and hooks into eyes at the panel separating the driver’s cabin and back section. It should fit directly. I already have the corresponding driver’s seat, same brown and with head rest. 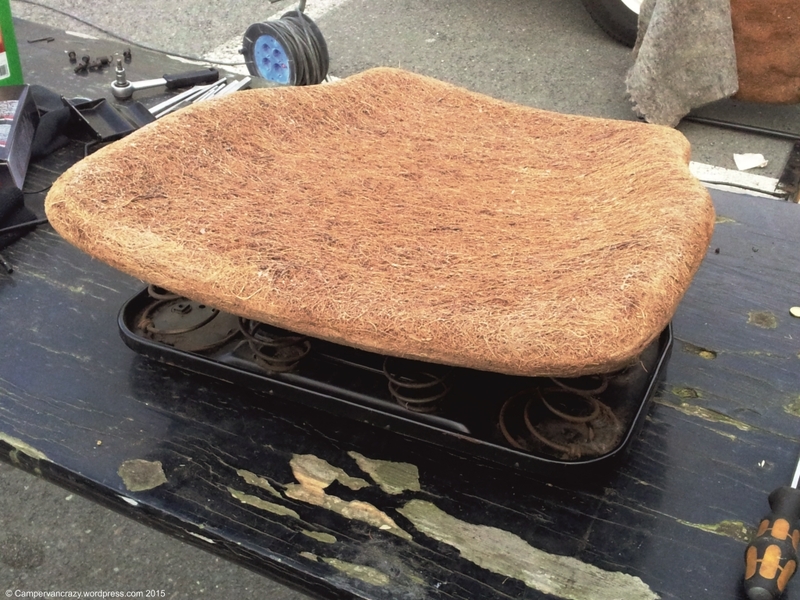 I also bought replacements for the inner horse hair paddings, two new ones for the two seat sections (bus-ok.de) and an old one in good condition for one of the back rests (Ebay). 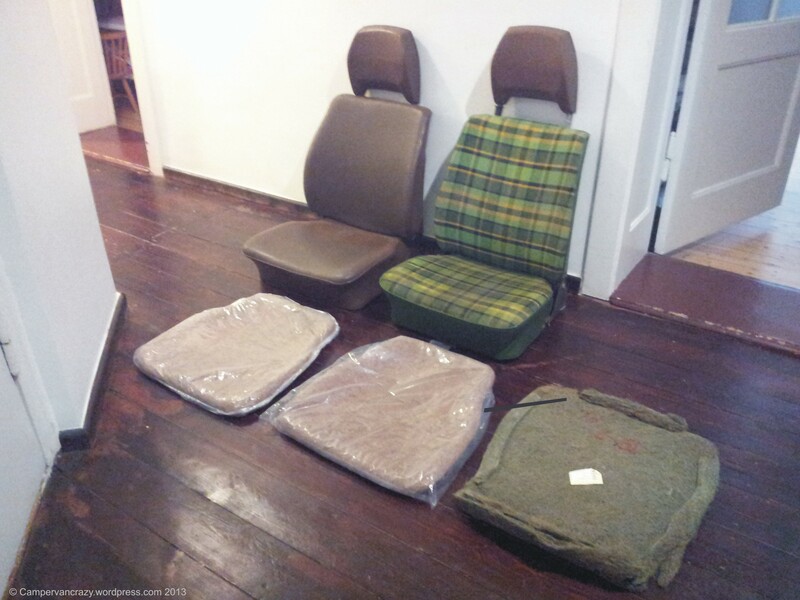 Once built in, this brown pair of seats would be original VW and from the right period, but not in black as the “leatherette” vinyl that Taiga Lily was delivered with. But for the sake of finally having head rests, they will do. 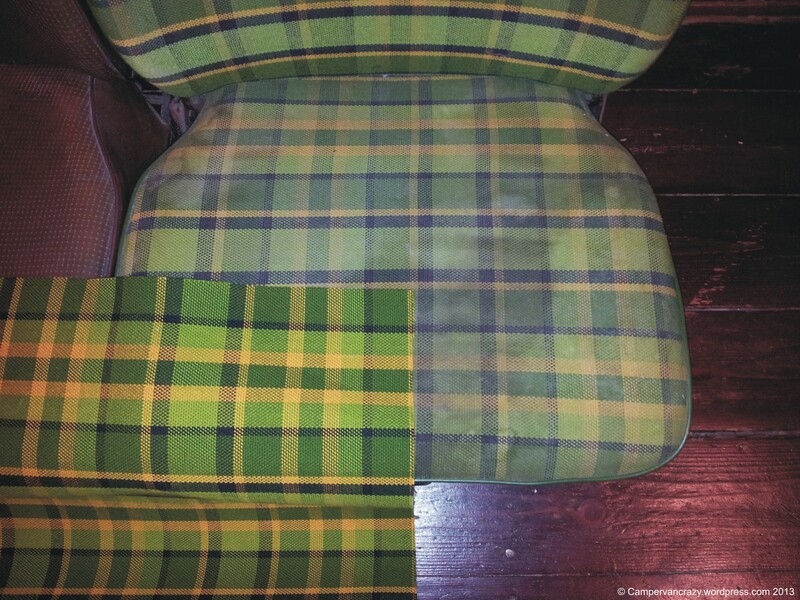 The green driver’s seat from a Westfalia camper comes with green-yellow-orange plaid similar to the material I am using for the mattress cushions in the back. I got the material as reproduction from Bus-ok.de. Below is a snapshot showing how it fits to the original pattern. Not really sure yet what I will do with this seat, but it may be a template and starting point for a restoration of two seats with this repro plaid. So all more the beginning of a new project, to be started after the next winter break.